Yesterday I joined the ranks of the Japanese ‘salaryman’. With a suit jacket, tie, and backpack full of lesson plans, I slipped into the stream of similarly attired Japanese men journeying at various lengths to their own 会社 (kaisha, company). My own commute on Mondays and Thursdays, to a company called Oclaro on the outskirts of Tokyo, is about 1.5 hours. Sitting on the Keio-Sagamihara Line train to Hashimoto station, I was surrounded by other Japanese men wearing similar suits, going to similar places, and making the same tired faces. I have to admit that, in a way, I was charmed. I think I felt a sense of the ‘collectiveness’ that Japan is so well known for — playing my part as one (albiet foreign) cell within Tokyo’s hard-pumping venous system. Of course, it was my first day; such feelings likely go the way of novelty with time. But somehow I think even the seasoned 部長 (buchou, company manager) might occasionally look up and feel at home in the communal rush of his fellow salarymen. 1) At Oclaro, and perhaps all Japanese companies, you trade your shoes for a pair of slippers at the door. This is true for Japanese households in general, but somehow I didn’t imagine that big companies would do the same. In any case, everyone in Oclaro walks around in these white slippers that remind me of a future-age hospital. d. if you’re at a table, put the card on the table in front of you. if you get several at once, try to organize them such that the people’s statuses are properly represented (ie. the boss’s card on top). The whole process takes about 20 seconds. It’s an adventure every time. 3) In Japanese companies, everyone with a desk job works in the same, massive room. There are partitions between the desks, but they only go up about 4 feet. The result is that, when standing, you can see everyone who is at work simultaneously. Even the upper level staff — managers, etc — simply have a larger dedicated area within the same huge space. It is so different from anything I’ve seen in the US. Perhaps another reflection of the collectivist culture. One way or another, a very different way of doing business, literally. To finish this up: I ate lunch in the company cafeteria. 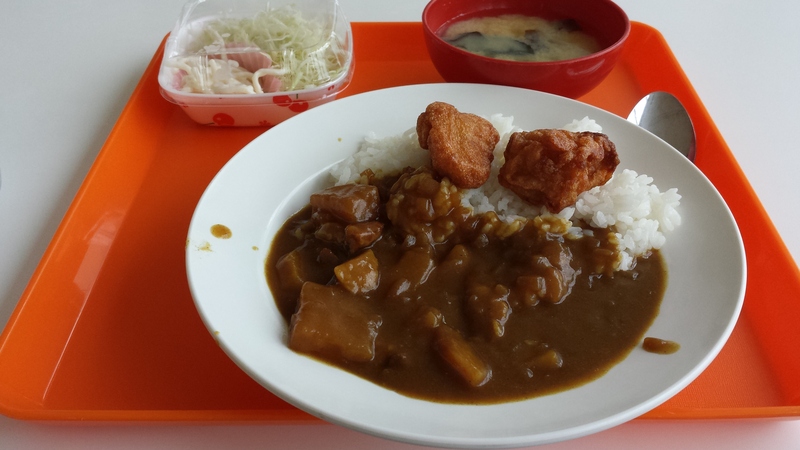 カレーライス (kareiraisu, curry and rice, duh) — delicious. In case you’re wondering, I’ve put vegetarianism on hold while in Japan for convenience’s sake. Good job, Tadesh. You really look like a salary man!!! I am glad that you took a suit jacket with you. I never thought of that. I never thought about Mei-shi. I should have created some and have given them to you so that you can spray them around, too. The food looks O.K. but not enough, was it? How much was the lunch? Should be something like 150 yen, which is about 1.50 dollars. Well, things may be different from the time when I was there. The spoon was quite the same, I bet. Have a good teaching and hope we can talk soon.